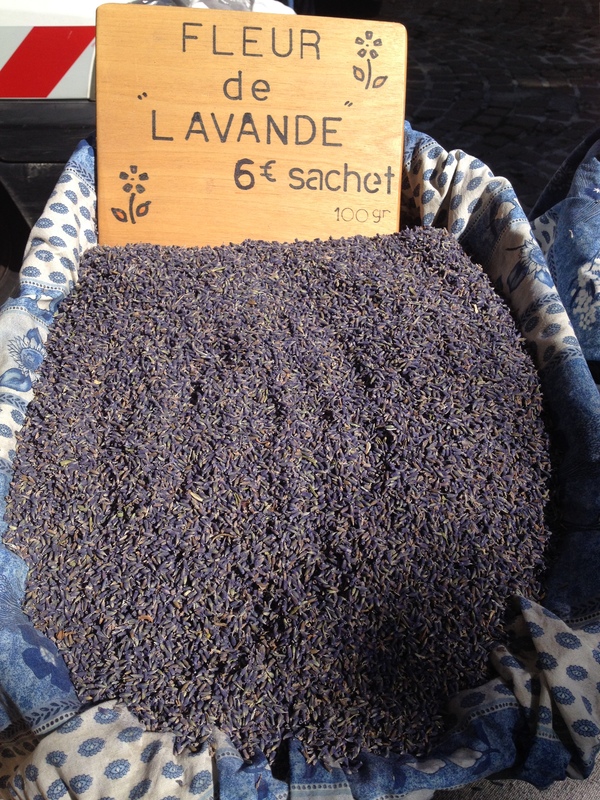 As you will have gathered from my posts I long to spend time in the markets that bring the towns in Provence to life. I can think of nothing nicer than wandering from stall to stall and shop to shop, absorbed by the intricate displays of fruit and veg and captured by the scents ranging from the tantalising smell of ‘roti-chicken’ or vast pans of bubbling paella to the ever present, calming undertone of lavender that so defines the area. For almost as long as I can remember I have wandered the markets and shops to the soundtrack of my 2 boys telling me that they’re ‘bored’, ‘tired’ or (most commonly) ‘hungry! !’ When they were younger they were happy to walk around munching handfuls of cherries and strawberries (their chins permanently red with juice), or tasting the huge variety of cheese or saucisson that are always on offer. Sadly though, in recent years they have been less accepting of my wish to visit as many markets as possible and the level of moaning has gradually increased to the point that I have had to control my enthusiasm. So you can probably imagine my delight when my husband suggested that, to celebrate our 25th wedding anniversary, we should spend a long-weekend away (without boys) in L’Isle sur La Sorgue, which I believe has the best market in the region. The thought of being able to walk around the market and fuddle around the delightful shops at our own pace, was almost unbelievable. I suppose a lot of people would want champagne, roses and diamonds for such an anniversary, but for me this was perfect. So the weekend was planned (with lots of late September cycling) but needless to say L’Isle sur La Sorgue was to be the Sunday morning activity with an added opportunity for some great ‘people-watching’ whilst having a slow breakfast as the ‘Cafe de France’ as the stalls finish setting up around us.. I always find the market there is incredible -the old town is taken over by stalls that run from square to square, packed tightly along the muddle of narrow streets in between. In summer the streets are so busy that just walking through them can be quite an effort, but either side of high season the numbers seem more manageable eventhough the market is still just as busy with traders. The stalls always seem to follow a similar pattern and in recent years we have got to know where to find our favourites, such as ‘Fromagerie Notre Dame’, which sells the most wonderful cheese infused with truffles (great melted with simple roasted winter veg) and the bread stall, just infront of the Church in the main square, where we buy ‘Fougasse au Roquefort’ to munch with a salad at lunch. There are always other shops that draw you in too, such as the wonderful ‘Fauque Beyret’ with its stunning, original shop-front and interior, which holds displays of beautiful and unusual home-wares that would grace the most stylish homes. One of the more recent places I’ve found is a local craft & design shop that’s hidden down a side street – marked by an ever changing piece of street art – Santa-styled ‘Wellie-Dogs’ at Christmas and more recently blue-painted toys and shoes, all designed to intrigue and pull you into the shop where you can buy unusual jewellery, clothing and fantastic handmade hats, all of which have been made in the area. Add to that mix the rambling antique stalls that take over the pavements to one side of the river that skirts the front of the old town, where each stall offers a different interior design inspiration – I can’t think of how many times I have come away with new ideas or seen ‘just the perfect thing’, but rarely have I had the time to wander at will and haggle if necessary. In this market you’ll find fine embroidered French linens and beautiful old glass and silverware side by side with enamel signs, posters and rusting agricultural equipment that would look great in the right setting. 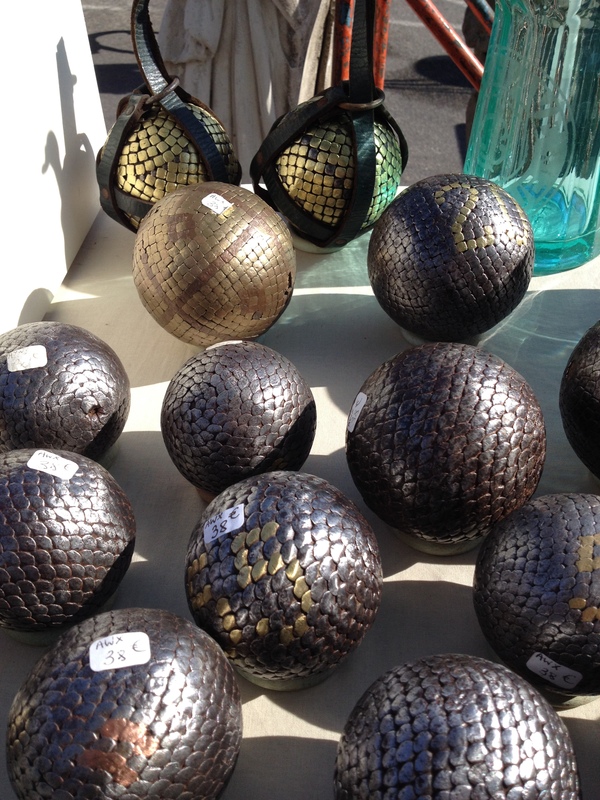 There are also displays of old metal ‘boules’ that catch the light and reflect the colour from the bright blue glass soda-syphons sat on tables next to them and other items that are just wonderfully ‘French’ and would demand even higher prices in the antique shops here. An entire Sunday morning (without children,) pottering around this unique shopping haven is the perfect present – it’s 16 years since we last managed it & I’m sure it won’t be 16 years till we do it again. My only hope (this time around) is that the bank-account and our suitcases are able to take the strain that is likely to result from this rare and exciting opportunity for stylish retail-therapy …… time will tell !! Previous Post Provence, No markets allowed! !